Archbishop Fulton J. Sheen (1895-1979) wore many hats throughout his illustrious lifetime: teacher, preacher, bishop, orator, writer, fund-raiser for missions abroad, convert-maker, radio personality, television star. And perhaps some time in the future, if the incipient cause takes root, there will be added saint. Dec. 9, 2004, marks the 25th anniversary of his death. (Having had great devotion to Mary, he often expressed the hope that when the time came, the Lord would call him on a Marian feast day. He nearly had his way.) As I wrote in these pages a few years ago, I was as a child a huge fan of his Tuesday night television program, Life Is Worth Living. Little did I imagine that our paths would cross many years later, when I was an editor at Doubleday & Co. What struck me in particular upon meeting him for the first time was his smaller-than-expected frame (television cameras obviously do wonders with capes). Born in El Paso, Ill., on May 8, 1895, he was baptized Peter, graduated from St. Mary’s parochial school in Peoria and in 1913 from Spalding Institute in Peoria, which was run by the Brothers of Mary. Then he went on to St. Viator College and Seminary in Bourbonnais, Ill., where he received a B.A. in 1917 and an M.A. in 1919. Graduate studies at The Catholic University of America earned him a J.C.B. degree in 1920. A Ph.D. from the University of Louvain in Belgium in 1923 was followed in one year with an S.T.D. from the Angelicum in Rome, and 1925 an agrégé en philosophie from Louvain. His many awards, distinguished citations and the like are too numerous to list. In 1950 Sheen was appointed national director of the Society for the Propagation of the Faith, whose offices are on Fifth Avenue in New York City, very close to the Empire State Building. The following year, as he was beginning the famed television series that aired until 1957, he was consecrated auxiliary bishop of New York. He received an Emmy Award in 1952, and years of electronic preaching continued with a flourish. In 1966 Pope Paul VI appointed Sheen bishop of Rochester, N.Y., and in 1969 archbishop of the titular see of Newport, Wales. In 1976 the pope named him Assistant at the Pontifical Throne. And for those who do not remember, the prolific Sheen also wrote two syndicated weekly newspaper columns and published scores of books over the course of several decades. Among the best-selling, and continuously in print for more than 50 years, is Life of Christ. Inevitably with such a multidimensional/multimedia persona as Sheen, material gets recycled occasionally; some parts of some books actually had their genesis in radio scripts, retreat talks and the like. Still, the sizable oeuvre of his original writings encompasses theology, science, morality, marriage, priesthood, philosophy and much more. Archbishop Sheen, however, was not without critics. What public figure ever is? Ecclesiastical rivalries, it seems, are part and parcel of the church’s history. But he declined to write about the past’s dirty linen, as it were, so readers had to be satisfied with the chapter of his autobiography, Treasure in Clay, entitled Things Left Unsaid. (The book, by the way, in gestation at the time of Sheen’s death, was published by Doubleday posthumously.) But the rivalry between Sheen and Cardinal Spellman, attendant struggles, the whereabouts of letters between the two and Sheen’s removal from the Archdiocese of New York and his appointment as bishop of Rochester, N.Y., are well chronicled in Thomas C. Reeves’s excellent biography, America’s Bishop: The Life and Times of Fulton J. Sheen (Encounter Books, 2001). Another notable, newly published biography is Fulton J. Sheen: An American Catholic Response to the Twentieth Century, by Kathleen L. Riley (Alba House, 2004). As is well known, Sheen was tenacious on many fronts, but perhaps especially when it came to defending the faith and railing against the evils of Communism; in this, of course, he was not alone. Riley covers the latter quite well in a lengthy chapter entitled Ideological Adversary: The American Catholic Crusade Against Communism. to my visits with the archbishop as he neared death after open heart surgery. He occupied a spacious apartment on the Upper East Side of Manhattan (detractors often cited his opulent lifestyle, among other faults). And yes, even near the end, he loved an audience. So after his attendants and/or staff departed, I would sit and listen while he read aloud the book’s latest installment. In an adjoining room the shelves of several tall bookcases were jammed with two, sometimes three, rows of books. To an outside observer it looked chaotic. But Sheen knew exactly where to reach for any specific volume. I was privileged on occasion to sit with him in his small private chapel before the Blessed Sacrament. Not a day of his priestly life passed, he often remarked, that he would not spend one hour in adoration. The holy hour was central to his daily life. And so, unsurprisingly, the theme of eucharistic adoration finds a prominent place in much of his oratory and writings. Another central theme was the power of the Cross. Without a Good Friday, he said, there would be no Easter Sunday. He preached Lenten services at non-Catholic as well as Catholic churches. But it was perhaps the three-hour-long Good Friday services at St. Patrick’s Cathedral and then St. Agnes Church on East 43th Street (renamed Fulton J. Sheen Place after his death) for which he is most fondly remembered by New Yorkers. It is interestingand this is not limited to Sheenthat in death people often have a second life. This is true, for instance, in the public’s expression of new or renewed interest in an author’s works. Since 1979, quite a number of books by or about Sheen have been (re)released. And they seem to have found their audiences. (The writings of Thomas Merton and Henri J. M. Nouwen offer parallel instances of revival.) Ignatius Press in San Francisco, for example, carries Treasure in Clay, the Life Is Worth Living series, The Priest Is Not His Own, Through the Year With Fulton Sheen and The World’s First Love. From Alba House in Staten Island, N.Y., a Sheen devotée can procure The Divine Romance, The Eternal Galilean, Guide to Contentment and The Seven Capital Sins, among other titles. Scepter Press publishes Three to Get Married, and among Sheen titles featured in Liguori’s catalogue are Jesus, Son of Mary (an illustrated children’s book), Peace of Soul and Lift Up Your Heart, as well as compilations. Among the latter is From the Angel’s Blackboard, which was published in 1995 to commemorate the centennial of his birth. In both its original hardcover and now paperback edition, the book has sold exceedingly well. So clearly there remains a market, both print and electronic, for Fulton J. Sheen. At least these publishers would argue so. There is no denying the impact of this electronic preacher on 1930’s radio (The Catholic Hour) and, two decades later, on the still-infant medium of television. Life Is Worth Living originated in 1951 and aired on Tuesday evenings on the DuMont network. I recall the cameras were often visible on the set. The half-hour show later moved to ABC, which aired it until 1957 and drew an estimated 30 million viewers. Sheen’s only prop during his talk was chalk and the famous blackboard, periodically erased by the studio angel. Since the program was commercially sponsored and Sheen was no longer talking in the name of the Church and under the sponsorship of its bishops, as he explained in Treasure in Clay, the tone and presentation of his talks had to be more ecumenical. And he always included stories and moments of humor, which audiences swallowed whole. The secret of Archbishop Sheen’s power was his combination of an educated and thinking head with a generous and feeling heart. Like every great figure in Christian history, Fulton Sheen regularly ascribed his gifts and his effectiveness to God.... [And] if Archbishop Sheen had not disposed himself to be the instrument of divine action, he would never have become the greatest evangelizer in the history of the Catholic Church in the United States. In September 2000 the Congregation for the Causes of Saints officially opened Sheen’s cause, conferring on him the title Servant of God. There are numerous World Wide Web sites devoted to Sheen and his writings. But if you wish to follow the road toward canonization, the site to visit is www.Sheen.Catholicexchange.com/foundation.html. The vice postulator of Sheen’s cause is Andrew Apostoli, C.F.R., who was ordained a priest by Bishop Sheen in 1967, in Geneva, N.Y. When asked why the cause had been opened, Father Apostoli mentioned first of all the personal holiness of Sheen’s life, reflected in his writings, talks and tapes. No one could speak in such depth of spirituality and have such a profound effect on people of all walks of life and of all ages without being a very holy person. Closeness to God makes one a greater instrument of his grace to others. That alone would indicate the Spirit of God was moving deeply in his life. And second, we need his message about life and its meaning in all its facets to be heard once again in our personal lives, in our church and in our world. He also noted that Sheen’s vast television audience was made up of more non-Catholics than Catholics. They listened to him because he spoke the truth with sincerity, and they deeply respected him for it. His is a voice that should never be allowed to remain silent. There will be a 25th anniversary memorial Mass on Dec. 9 at St. Patrick’s Cathedral, under whose main altar Sheen is interred. Presiding will be New York’s Cardinal Edward Egan. The celebrant will be Peoria’s Bishop Daniel R. Jenky, C.S.C. The event will be co-sponsored by the Archbishop Fulton J. Sheen Foundation and the Society for the Propagation of the Faith. A life lived well is a life worth rememberingand, according to some, it was a life somewhat mysterious. As Ms. Riley concludes in her book, the real Fulton Sheen remains...elusive....The man in the spotlight succeeded in keeping himself partially hidden in the shadows. But there is no mystery in the fact that Sheen’s adventure’ was an unparalleled one. Many thanks to Patricia Kossmann for calling attention to the 25th anniversary of the death of Archbishop Fulton J. Sheen on Dec. 9 of this year. During the seasons of his “Life Is Worth Living” television series, the bishop would periodically decamp across the Hudson for a few days. His objective? The so-called bishop’s suite in St. Michael’s Monastery of the Passionists in Union City, N.J.
As I begin to write a new homily, that memory comes back and gives me the courage to keep trying. Maybe it’s the same for my good classmates. 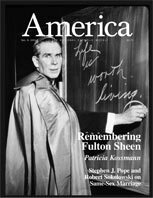 Patricia Kossmann’s excellent article “Remembering Fulton Sheen” (12/6) brought back a host of pleasant memories of a time when a charismatic Catholic priest captivated television audiences of every creed. In those long-ago days in the 1950’s, when not every family had a television set, I gathered on Tuesday evenings with up to 20 others to watch “Life Is Worth Living,” featuring Fulton J. Sheen. It was an event not to be missed, and I was always one of the few Catholics among the neighbors who sat mesmerized in front of that tiny television set. Some years later, around 1963, I was the principal of the American school for military dependent children located near the Plaza Castilla in Madrid. A friend working for our embassy tipped me off that Fulton Sheen was to say Mass the next morning at the Jesuit church just down the street from the embassy. On that day I asked my Spanish secretary to cover for me, jumped into my Volkswagen bug and headed to the church. Much to my surprise, the number attending Mass seemed the same as on any normal weekday. I appeared to be the only American in attendance, which struck me as odd because of Fulton Sheen’s celebrity status. At the end of Mass, I waited on the granite steps of the church like some star-struck teenager waiting for a rock star. The bishop soon emerged from the church accompanied by a priest, who turned out to be Irish. I engaged the great man in conversation for a very few minutes, and as I could see he was waiting to hail a taxi, I offered to drive him to his hotel. He graciously accepted my offer, and the two priests crowded into the Volkswagen, with the great man sitting in front. I failed to ask the name of their hotel, and I proceeded to drive back toward the school. After a good 20 minutes and a never-to-be-forgotten conversation, I was asked if this was the way to the Hilton Hotel. Embarrassed, I did a quick U-turn and headed back into the city. Arriving at the Hilton, Bishop Sheen graciously thanked me for the ride and for the conversation. During the whole trip, which took just a little less than an hour, the Irish priest said nothing, nor did I once even acknowledge his presence. Alighting from the little car, he gave me a wink, a smile and a handshake, and I headed back to school. Though this took place well over 40 years ago, I still have vivid memories of that magical brief encounter. This article also appeared in print, under the headline "Remembering Fulton Sheen," in the December 6, 2004 issue. Patricia A. Kossmann is literary editor of America and editor of Fulton J. Sheen’s From the Angel’s Blackboard and Simple Truths.